The work of musical outlier Jon Hassell is resistant to description. Alone in his field, he continues a decades long career in opening up and exploring sonic space. Perhaps more closely associated with the genre of Jazz than the Ambient, Electronic and World Music it also draws on, Last Night the Moon Came Dropping Its Clothes in the Street (63'53") places Hassell amidst a cadre of innovative musicians - together envisioning a Jazz-laced, ethereal doorway into mind and mood. The ten tracks each feature the unique sound of Hassell's trumpet, played at an intimate conversational pace. Blown whisper soft, or modified with additional harmonics, and in places singing straight and solid, the tone is strange and wonderful - evoking the metaphysical dimensions within the player. To realize this album the ensemble attains a state of receptivity. All of the sounds surrounding Hassell's trademark trumpet (including guitar, keyboard, violin, bass, percussion and live sampling) are rendered with such warm appreciation for their complexity, and played (or not played) in just the right places. 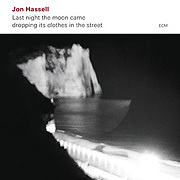 Confident and at the height of his powers, Hassell's CD is a singular act of artistic imagination. From jungle electric, to urban heat and enigmatic quoting of beloved standards, Jon Hassell's music just flows in its infinite variety - which may change our expectations of Jazz forever.